Why is it that if something is for sale in an auction we automatically think it must be a good deal? We start bidding low and then keep going as we get out bid and decide that if someone else wants it then we must have it! I think that is the secret of eBay's success. They concept behind eBay is that it is an on-line auction where you can get good deals or find hard to find items but there are lots of things for sale that are no cheaper than if you bought them in the store. Some of them are even more expensive! But I fell for it and bought some Manos del Uruguay yarn. It seemed like a good price - $4.50 for a skein. But then of course there is $6.00 of shipping! But that $6 stays the same if you buy 2 items so I bought 2 skeins . . . Now all in all I think I did get a good deal because for $15 I got two skeins of Manos delivered to me but unfortunatley the color is not at all the same as it was in the photo. On eBay this yarn is a very deep dark purple. However in real life it is this light motled purple. It's still pretty but not what I thought I was buying. So is it still a bargain? I suppose that depends on what I decide to make out of it. Any suggestions? Felted bags are great with manos. I've done scarves and mittens with it. 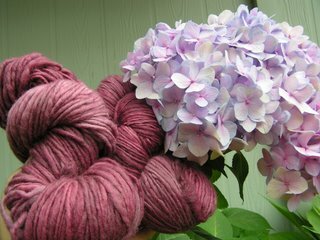 Two skeins will do any of those! Well, it looks pretty. I agree with deborah - a felted bag would be nice. I saw your post about the gloves. I'll look tonight was size needle.Very small. I used 2 DPNs - probably a size 2, but let me check. You did get a good price. I paid $12 a skein at Stitches. You definately got a very good price for some wonderful yarn. I made felted oven mitts out of some Manos recently...from the Bev Galeskas book. They turned out very well and work well too. If this is not a color that you would wear, try the mitts or potholders. I also like fingerless mittens and there are lots of patterns out there for these.